The new school in Tarifa has been opened. The world champion in kite freestyle after an accident and damaged shoulder has decided to open his own shop and school in Tarifa. Kiting - ist eine relativ neue Extremsportart mit großen Geschwindigkeit, die unglaubliche Sprünge und mit den vielen positiven Emotionen. Das Wort "Kiten" hat keinen Bezug auf das Spiel des Kindes. "History of a kiting" - 2 part In 1822, George Pocock , a schoolteacher, made ​​stroller which pulled with the four kite. He did not paid the tax, because he rode without the horses. Spin Out has jointed us! The famous kite and surfing places in Spain are Tarifa, Estepona, Marbella, Rodilles, Roca Puta, Isla de Santa Marina. The surfers can find there the quality and diversity of the waves. We are already on Google+. Surf, kite and wind surf in Spain, in Andalusia, in Cadiz, in Tarifa. Best kite and surf equipment center in Tarifa. Here you find a lot of photos from Carnaval in Tarifa. More and more people in the world are fond of wind-surfing and kite-surfing..... 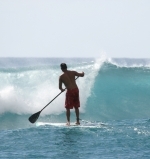 Although surfing appeared on Hawaii islands - nowadays it is popular particularly on all coasts of the world. Time to enjoy kite-surfing: you can find kite lessons and courses on our site. You may to find instructors, to make order for kite-equipment here. All on our site, in several minutes!